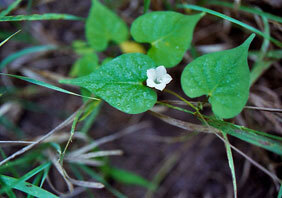 Also Called: Small white morning-glory, white star. Stems: Twining vine, 3 to 10 feet long, glabrous to sparsely pubescent. Leaves: Alternate, simple, broadly ovate, 1.25 to 3.25 inches long, .8 to 2.8 inches wide, entire to angled or 3-lobed, glabrous to sparsely pubescent; tip blunt or pointed; base heart-shaped; stalk 1 to 3 inches long. Inflorescences: 1-3 flowers in leaf axils; stalks usually shorter than or equal to leaf stalks, glabrous. Flowers: Sepals 5, nearly equal, 1/3 to 3/5 inch long, lanceolate, short- to long-pointed, fringed; corollas funnel-shaped, 3/5 to 1 inch long, white or occasionally pinkish, 5-lobed; lobe tips terminating in tiny, short points; stamens 5, of unequal lengths; filaments white; anthers purple. Fruits: Capsule, nearly spherical, about 1/2 inch in diameter, bristly-hairy; seeds 4 or rarely fewer, ellipsoid, about 1/4 inch long, dark brown, glabrous. Habitat: Low ground, waste areas, disturbed sites, thickets, wet meadows, moist prairies, and roadsides; moist, alluvial soils.